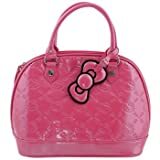 This Hello Kitty honeysuckle pink patent bag has an embossed pattern of Hello Kitty faces and bows. There are 2 inside pockets and a zippered inside pocket. Add a little glam to your day or night with this eye catching tote!